The future is generally an optimistic place. Sure, there are killer robots and genocidal aliens, Daleks and Cybermen, all that sort of stuff, but Doctor Who generally proposes that the human race will endure. That we can pick an arbitrary point on the timeline of the universe, and somewhere we will find human beings, doing human stuff. Given that the show was produced in the shadow of the atomic bomb and mutually assured destruction, that’s a pretty optimistic view of things. Indeed, even the second script for the series, The End of the World, found a way to make the destruction of the planet Earth seem like it wasn’t that big a deal. We’ll survive and endure and evolve. There might be the odd bump in the road, but we’ll fix it soon enough. Occasionally we might need help from the Doctor, but he’s only really helping us achieve our potential. All is good. Things will get better, things will get worse, but things will always be. And that’s where Utopia kicks in. We get a bleak, dark, starless future where the last of humanity huddles in the dark – waiting to die. Indeed, Jack is explicitly identified as a freak because he can’t die. Death is seen as the inevitable natural order of things. These last humans have a rocket, but they can’t launch it. Even if they could launch it, all they have to go on is a faint signal being broadcast by god-knows-who from god-knows-where. That’s pretty dark stuff, right there. Really, the closest thing in the history of Doctor Who was Peter Davison’s criminally-underrated Frontios. Don’t you see that? The ripe old smell of humans. You survived. Oh, you might have spent a million years evolving into clouds of gas, and another million as downloads, but you always revert to the same basic shape. The fundamental humans. End of the universe and here you are. Indomitable! That’s the word. Indomitable! Ha! This being a prelude to a Russell T. Davies season finalé, those words will inevitably come back to bite him, but it’s easy enough to agree with the general sentiment. We survived! Woot! Pat yourself on the back there! There’s something a little troubling about the idea that “the same basic shape” apparently represents the pinnacle of evolution, but we can look past that. Except that everything dies. Even, as we learned in The Parting of the Ways, the Doctor dies in one form or another. Even, as explored here, the universe itself dies. It doesn’t matter if there’s a rebirth or a new beginning afterwards, there’s still death. There’s still the end, the darkness, the eternal night. As much as the refugees might bundle themselves into a rocket and set off deeper into the darkness, there is the reality that the darkness must eventually consume them. 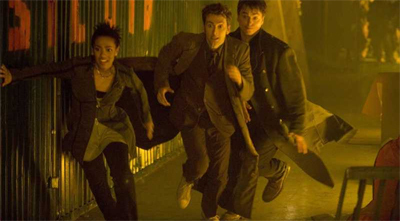 Doctor Who is so often focused on running around and the importance of life that it brushes past that inevitability. Indeed, Utopia is filled with lots of running around. Davies does a fairly effective job setting up both the solution to this episode’s cliffhanger and the reveal of the Toclafane here, but he keeps things moving so fast that there’s a good chance you might miss them the first time around. That doesn’t mean that they aren’t there. There’s darkness here, and not just outside. There’s every chance that the humans will die before they reach Utopia, but there’s also something more insidious suggested. The Futurekind wander around, looking fairly human and even capable of speech. Apparently the only way to distinguish between human and Futurekind is to examine the teeth, but even then some are able to slip through the net. The Futurekind are not, according to Yana, some strange alien menace of the week or mutants or biological freaks. They are humans. “We call them the Futurekind, which is a myth in itself,” Yana explains, “but it’s feared they are what we will become, unless we reach Utopia.” Even in the future, even on the brink of the end of all things, humanity still hasn’t quite sorted itself out. It certainly doesn’t bode well for the Doctor’s faith in us that, even as the universe dies around us, we’re still a bit of a mess. Indeed, it rather effectively sets up the devastating reveal in The Last of the Time Lords, as the Master tries to completely destroy the Doctor’s faith in humanity. Utopia also reintroduces Captain Jack. 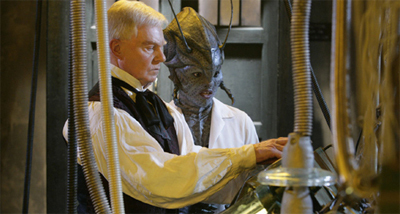 I’m actually quite fond of the character as a companion – certainly more than as a lead in Torchwood. While I’m disappointed that we haven’t had more of Jack as a companion, he serves a fairly effective purpose here. He’s that final piece of the puzzle for Martha, who has spent the better part of the last year learning that the Doctor isn’t always mindful of his companions. 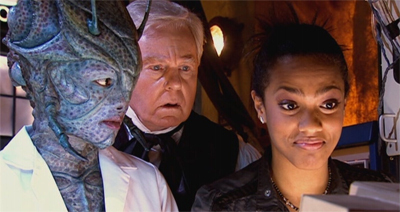 Here, Martha meets one of her predecessors, and discovers something she probably assumed – that the relationship between Doctor and companion doesn’t always end happily. “But the thing is, how come you left him behind, Doctor?” Martha asks, and it’s a legitimate question. The Doctor offers a flippant response, “I was busy.” Martha follows up with, “Is that what happens, though, seriously? Do you just get bored with us one day and disappear?” What’s interesting is that Davies could probably mount a defence that would make the Doctor’s actions seem relatively forgiveable, but he opts not to. 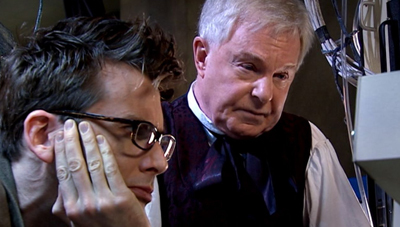 Indeed, the reasons that the Doctor abandoned Jack had been open to a fair amount of speculation. The urge would be to construct a narrative that might cast the decision in a relatively inoffensive light. He was in the middle of regenerating after all. Maybe he just really forgot. After all, the Doctor has done the same sort of thing before. I am specifically thinking of dumping Tegan in Time-Flight and promising to come back for Sarah Jane in The Hand of Fear. Since the Doctor is generally presented as something of a liberal-minded champion of the individual, that’s a very bold statement. “So what you’re saying is that you’re prejudiced?” Jack responds, and that’s not an unfair summary of the situation. It hardly presents the Doctor as heroic. Leaving your friend behind in a completely alien environment after he died for you is a pretty dodgy decision. However, abandoning him because of some social prejudice is even more damning. Of course, the Tenth Doctor’s moral outrage doesn’t extend to the guns used to protect the launch site. After a guard uses his machine gun to scare away the Futurekind, Jack sarcastically quips, “Oh, don’t tell him to put his gun down.” The Doctor responds, again indulging in hypocrisy, “He’s not my responsibility.” Jack retorts, “And I am? Huh, that makes a change.” Jack certainly has a fair point here, and the Doctor is being a bit disingenuous. He readily (and enthusiastically) volunteers to help the humans leave the planet, but never once complains about their guns. To be fair, Martha does seem more sympathetic towards the Doctor when she discovers that Rose is “trapped” in another dimension with her family, but her frustration at being constantly compared to Rose feels legitimate. The Doctor’s obsession with Rose does repeatedly demonstrate how short-sighted he is, and hints at his lack of emotional intelligence. He’s so caught up in his own pity party that he’s blind to how crap it must be for Martha. Unfortunately, while this portrayal sheds light on the Doctor as a character, it doesn’t do much for Martha. I do like that Martha’s growing resentment of the Doctor’s lack of tact and his attitude towards her. It is entirely justified, and it feeds into The Sound of Drums quite well. However, it doesn’t do much to define Martha as a character in her own right. I think that Martha’s lack of development beyond “capable companion”, “is not Rose” and “is growing tired of being compared to Rose” is one of the biggest weaknesses of the third season. There’s also the somewhat unpleasant suggestion that maybe Davies thinks that the Doctor’s obsession with Rose is not weirdly out of whack. 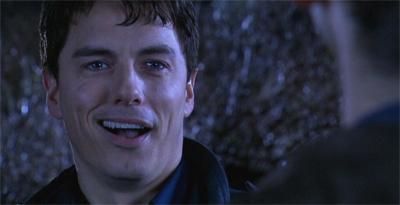 His difficulties relating to Martha, and the fact that she is sick of hearing Rose’s name, suggest that maybe the Doctor really just needs to get over Rose, but Davies is very quick to have Jack indulge in the same sort of Rose fetishism. 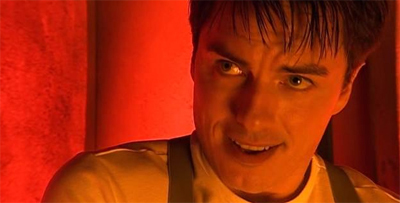 The Doctor spent two years with Rose, and yet it seems that Jack has developed the same sort of borderline creepy obsession despite only spending three on-screen stories with her. “I went back to her estate, in the nineties, just once or twice,” he explains. “Watched her growing up. Never said hello. Timelines and all that.” Ah, time travel. Enabling stalkers from the future. Regardless of whether it’s “just once or twice”, it is still pretty creepy. However, Davies treats this as if it’s meant to be the norm for men who spend time with Rose, which is a little unnerving. 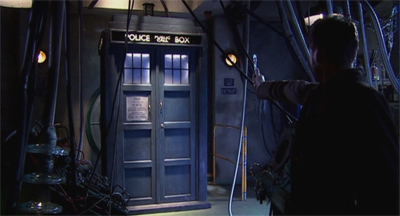 It suggests that the Doctor’s difficulties losing her were not unique to him, and perhaps that they aren’t to be treated as a character flaw, but the logical response to the situation. It casts a certain shadow over all of the Doctor’s shady characterisation – because it suggests that it’s not intended to make the character look like a jerk to Martha. And then there is the Master. The reveal at the end of Utopia is easily one of the great moments in Doctor Who history. It’s just handled, paced, written and directed perfectly. Indeed, Davies structured the season remarkably well. The presence of Human Nature and Family of Blood means that we know exactly what the significance of the fob watch is before we discover what’s hiding inside. We don’t need to know who the Master is, we just know that it is a big deal. 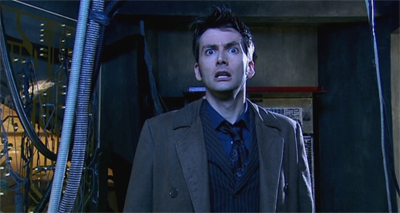 I also love that the Doctor’s immediate reaction on hearing about Yana’s watch is one of abject terror. The Doctor has spent so long feeling angsty over the loss of the people, that you would expect some measure of enthusiasm at the discovery of another member of his kind. Again, we get the suggestion that the Tenth Doctor might be just a bit of a hypocrite – that despite how he likes to play the “last of his kind” card, that on some level he doesn’t really miss his people. Of course, it’s entirely possible that – on some level – he just knows that it is the Master, but there’s no hint of hope here, no suggestion that this could be the best thing ever. 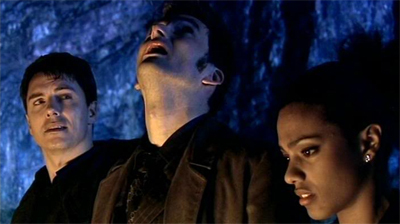 He completely and utterly freaks out at the idea that he’s no longer the last of the Time Lords. 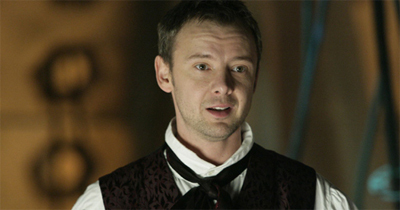 If Jacobi’s portrayal of the Master is intended to mirror Eccleston’s turn as the Doctor, then it’s quite clear that John Simm is channelling David Tennant. Indeed, this regeneration of the Master explicitly sets out to regenerate to match the Tenth Doctor. 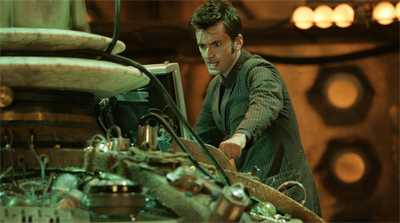 “Still, if the Doctor can be young and strong, then so can I.” Indeed, the Master even gets a “new voice” moment in the TARDIS, in what is clearly a shout-out to Tennant’s “new teeth” bit after he regenerate. As an aside, I like the idea that the Master is just better at regenerating than the Doctor. Based on Romana’s skill with it, it seems the Doctor lacks the knack for it. 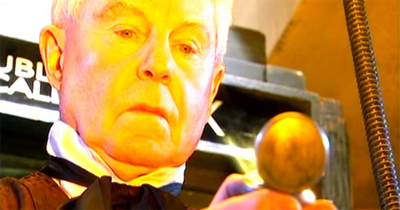 It also explains how John Simm’s “crazy dial” regenerates at just the right level. There’s no “post-regeneration trauma” here. I don’t mind Simm’s portrayal, because Davies at least has some idea of how he plans to use the character, but I do think that Derek Jacobi’s Master is a wasted portrayal. Maybe they could bring him back for the anniversary. Utopia is often dismissed as a lot of padding leading up to those final ten minutes. I’d argue that it’s one of the best-scripted episodes to be included as part of Davies’ season finalés. Davies is a writer who tends to do better with characters and themes than with plotting. In particularly, he has difficulty with ending his scripts – particularly as the threat and scale balloon. We’ll see that in two more episodes. Oddly enough, he works better when he’s executing a simple premise, and given room to play to his strengths within that plot. Smith & Jones is his best season premiere, and it’s just a variation on the “base under siege” model. That simple structure allows for nice character work and sparkling dialogue. 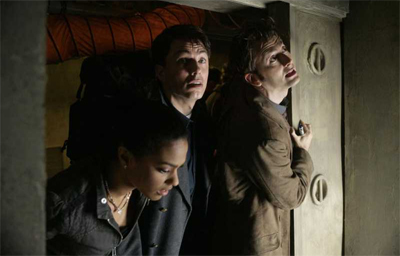 Midnight is a typical Doctor Who set-up, until Davies pulls the rug out from under us and and twists that basic premise to explore the importance of the companion. Utopia doesn’t have the most compelling of plots, but it does have lots of room for nice character work that pays off. Could you use a lift? We get to see the Doctor and the Master interact socially and admire one another’s brilliance. We get to see Martha move one step closer to leaving the Doctor. We see the Doctor has some pretty major character flaws. We even get a nice scene between Chan’tho and Martha that makes us care for her before the Master brutally and inevitably murders her. More importantly, the Futurekind effectively foreshadow the Toclafane and the literal darkness here reflects the thematic darkness of The Last of the Time Lords. It’s telling that the best aspects of The Last of the Time Lords are seeded here, where Davies isn’t under constant pressure to map out a gigantic blockbuster plot. In contrast, it’s the elements that build on the more tightly-wound The Sound of Drums that feel ham-fisted and awkward. I’ll be the first to criticise The Last of the Time Lords, but I think the way that Utopia is constructed is a major reason that the episode holds together for as long as it does. I like Utopia. I’d argue that it’s a much stronger episode than the two that follow, even if it isn’t the most ambitious Doctor Who script ever written. Still, it’s good stuff that does an excellent job with all the characters involved. Thanks Saskia. We have a new one most weekdays, so feel free to check back!